Quote: On the first day back after summer break, high-school student Aoba is attacked by a giant robot that appears out of the sky. As he's pursued through the city, his classmate Hina appears in a robot of her own. She rescues him, and tells him cryptically that "Dio is waiting for you", before she disappears. This begins Aoba's new life as the pilot of the Free Treaty Alliance against the Great Zogiria Republic. This anime is one of the most unexpected development in the few early episodes. From the common high school life with , to a mysterious girl coming from the future to apparently save Aoba, giant mecha dropping from the sky to terminate him, and a time travel phenomenon that changes his life forever. Sounds complex right? That’s just the tip of the iceberg as the show doesn’t reveal much in the beginning. The only clues from the beginning are from the mysterious girl named Hina. Let the complexity ensure. 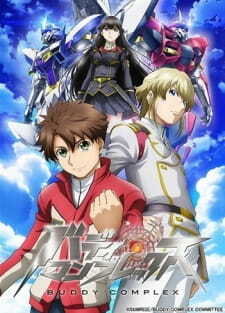 Buddy Complex is a mecha anime from Sunrise that does not push any boundaries, unlike Valvrave. At the first battle scene you will think that is this really not a strange anime? However, the story development is very well done. The battles display differing tactics after failed attempts rather than having the same few machines doing the same few moves against each other, which happens in quite a few of Sunrise's previous mecha series. It is a delight to see how our main characters get out of the various difficult situations they are forced into. Coming from Sunrise, it is not much of a surprise that the art and sound are well done. The character are normal, but the art of Luxon and Bradyon is nice, and when both of them in coupling mode is so damn cool, like how the wings glow and all the cg effects stuff. But the 2 mecha still look like some No-grade Gundam. If Buddy Complex have more budget, the mecha will definitely look nicer with a bit of more detail. The battles scenes are amazing and do not have a noticeable amount of re-used scenes. It is a joy to watch for the art and sound alone. I like both the opening and ending, except the ending somehow give me the feel of watching Gundam Seed ending(note: ending here isn't the final phase). Nevertheless, everything sounds right in this anime. The background music during the battles and while they are on standby fit in very well. All of the characters seem ordinary. However, they are easily likable and feel human enough not to feel two-dimensional. Also, when they get emotional, there are clear reasons behind them (i.e. their emotional spurts do not seem to be pulled out of nowhere). There are also no noticeable plot holes that I have noticed while casually watching the show. I like Hina a lot in this anime, her depicted character with her long black hair and purple eyes. This is where the series shines for me. The anime does not become too ridiculous or too boring, and nothing about it bugs me. All the coupling scenes is good, I also enjoy how Aoba always talking about Hina as though Hina is his only one. But it's really enjoyable to see fast action mecha fight that is not one sided, even when it is, it will and must be overwhelming! Overall, this anime does not try to be anything out of the ordinary, but its excellent execution and animation bring this anime as one of the few good mecha anime.